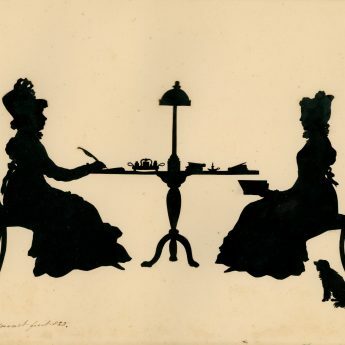 It seems appropriate that silhouettist Augustin Edouart chose to show these two ladies busy with their genteel pursuits as they were both creative women. 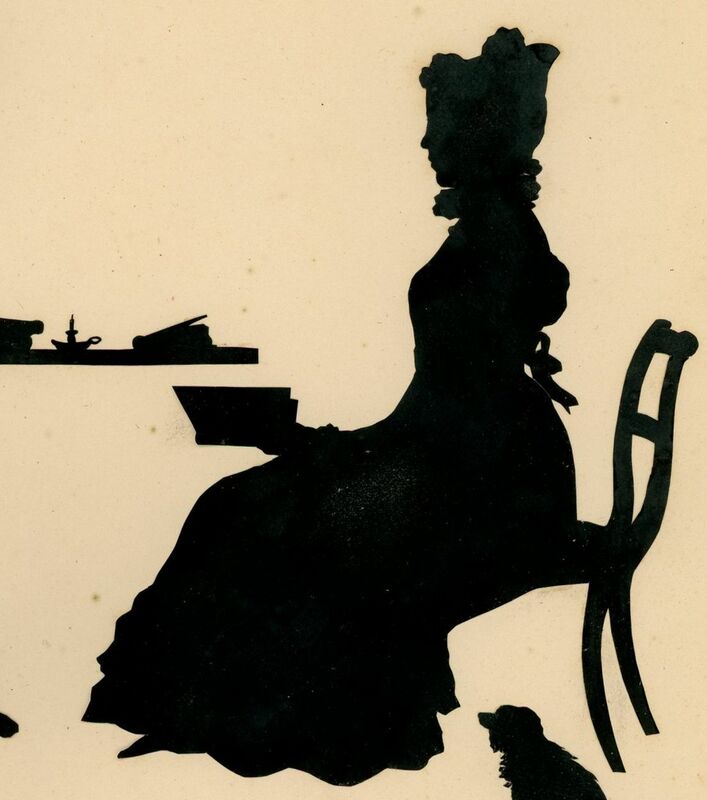 Sitting reading by candlelight with her little dog attentive at her feet, is Sophia Maria Jane Bonnell. 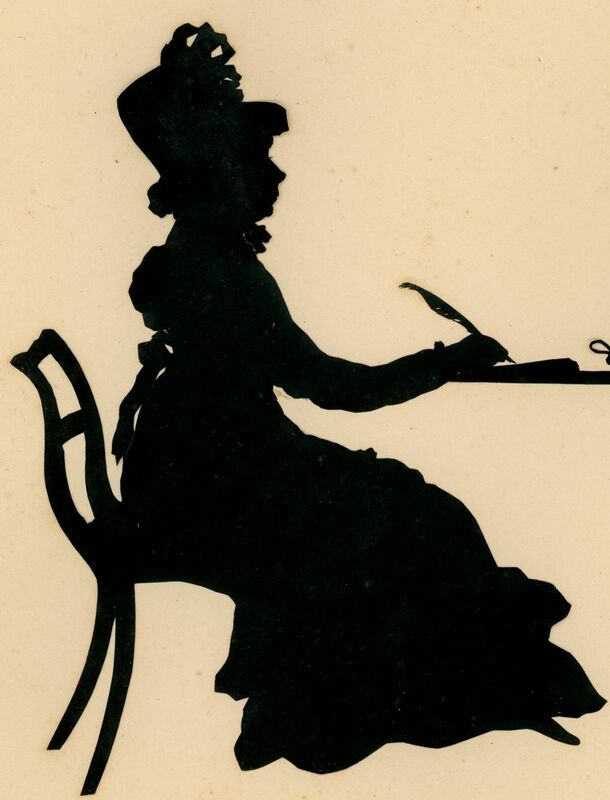 Sitting across from her looking elegant in her bonnet and busy writing with a quill pen is her young friend Mary Anne Harvey (later Bonnell). Jane was born in 1748 and married James Beal Bonnell of Pelling Place, Old Windsor. The couple had no surviving children and Jane was widowed in 1815. 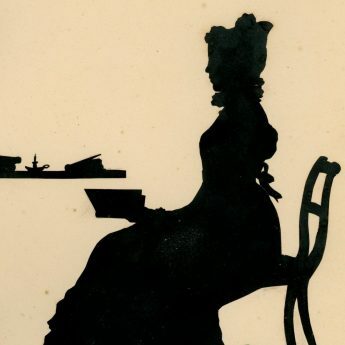 Her widowhood lasted 26 years and she was 93 when The Gentleman’s Magazine announced her death in March 1841. 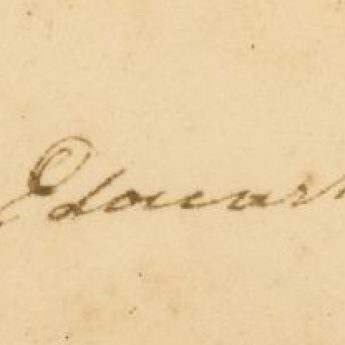 She bequeathed Pelling Place to Mary Anne who subsequently added Bonnell to her surname. Jane also left £10 a year “for a dinner every Christmas Day to as many poor men and women as that sum will furnish” to be served at the Fox Public House. 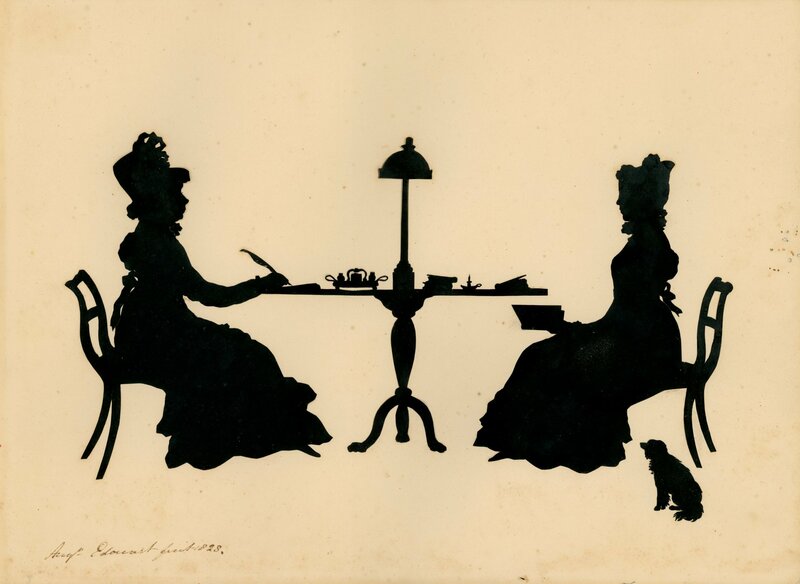 In addition to “fine Sirloin” and “good Plum Pudding” her guests were to be served strong beer – “each man to have one quart and each woman to have one pint”. Her legacy lives on even today though the actual serving of Christmas dinner ceased in 1965. Between 1780 and 1781 Mary Anne and Jane worked together to create an elaborate arrangement of flowers in a vase from shells that they imported from all over the world. The vase can be viewed in the collection of the Victoria & Albert Museum. 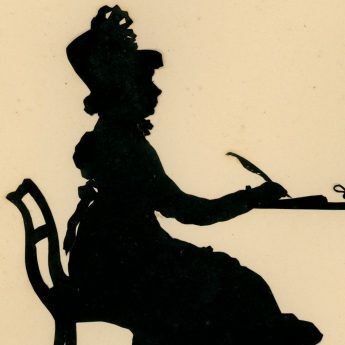 Mary Anne was also skilled at hair work and paper filigree and amongst her projects decorated a cabinet with rolled paper with inset hair pictures. 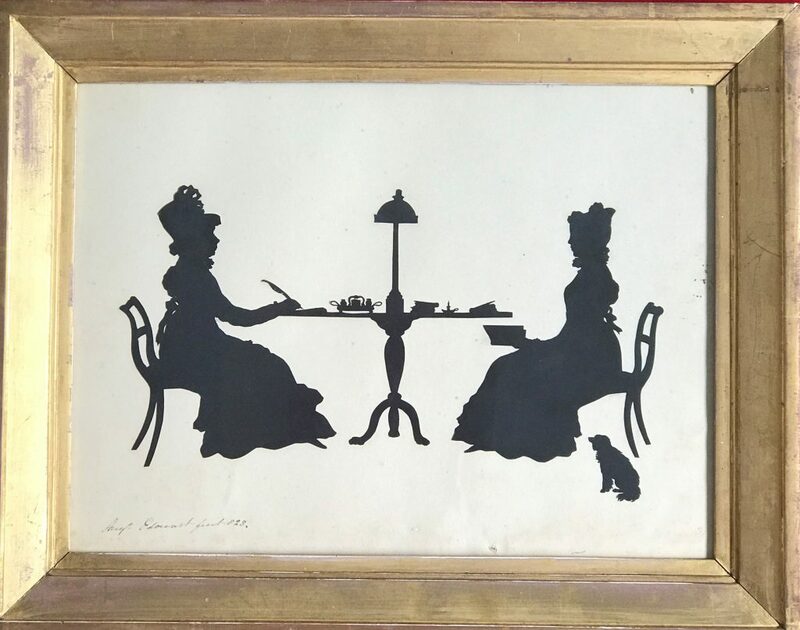 Living as they did in Old Windsor, it is likely that the two ladies were well acquainted with the daughters of George III and with Princess Elizabeth in particular as she shared Mary Anne’s love of paper crafts including silhouette cutting. The silhouette has been cut and pasted on card. It is signed bottom left “Augt Edouart fecit 1828” and is presented in a period giltwood frame. 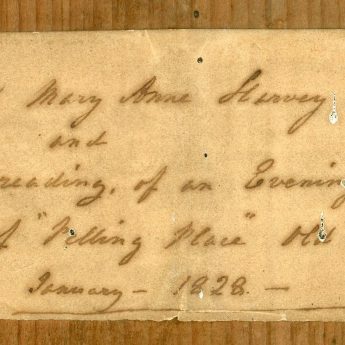 An inscription on the backing board reads – “The profile of Mary Anne Harvey writing / and / Jane Bonnell reading of an Evening in the / Library of ‘Pelling Place’ Old Windsor Berks / Done January 1828”. Although in remarkably clean condition, there is slight browning along the bottom edge and some scattered spotting. There are also some small insect holes visible on the right hand edge with another on the bottom edge. 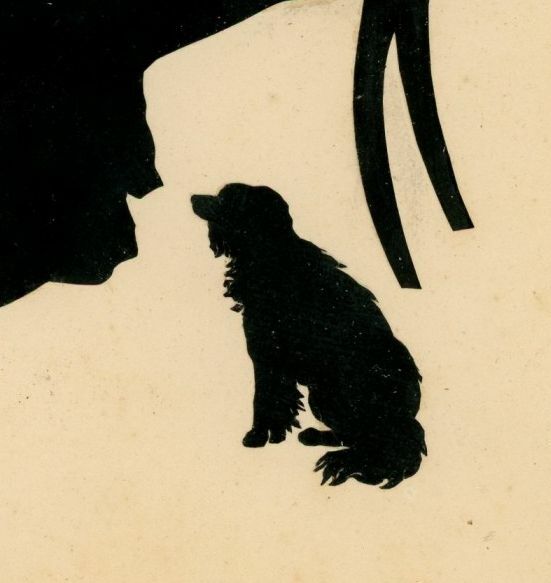 A piece of acid-free card has now been inserted behind the silhouette. As an ex-Bonapartist claiming asylum in Britain, Augustin Edouart (1789-1861) set himself up as a dealer in French and fancy goods in Cheltenham. Unfortunately the enterprise was declared bankrupt in May 1826 and he needed to find an alternative career. Quite by chance he discovered, when challenged at a dinner-party, that he had a natural aptitude for cutting likenesses, so much so that he thereafter made a successful career of it. 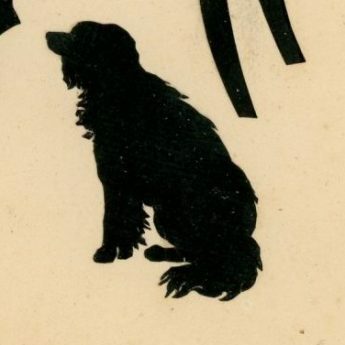 He toured extensively throughout the British Isles for several years cutting many thousands of profiles including well-known figures of the day, many of them authors, musicians, politicians and royalty. In 1839 he set sail for America where he toured successfully for ten years before deciding to retire to his native France. He nearly didn’t make it though as his ship went down in a storm off Guernsey. Fortunately the passengers were all rescued but Edouart lost virtually the whole of his precious archive of work and the will to continue to work commercially thereafter.